Dropbox announced that it is rolling out Recents to dropbox.com so web users can quickly access files they’ve recently opened, added, edited, or moved. The feature was previously available on iOS, but it’s just now coming to the web version of Dropbox. It debuted in May, and was integrated into iOS 9’s Spotlight Search in October. It will hit Android sometime soon. Why? Because you don’t need to click through your folder structure every time you want to pull up the file you need at that moment; you don’t even need to remember what folder you saved the file to. For one, that means you can embrace an unorganized Dropbox account. If you don’t have time to regularly sort all your files into their proper Dropbox folders, it’s okay — the files you’re most likely to need will be easy to find in Recents. This view also lets you easily pick up where you left off on a different device. For example, if you need to leave the office but aren’t quite finished with that presentation, save it to Dropbox from your work computer. It will be at the top of your Recents page on your tablet, so you can quickly open it and continue working on the train ride home. 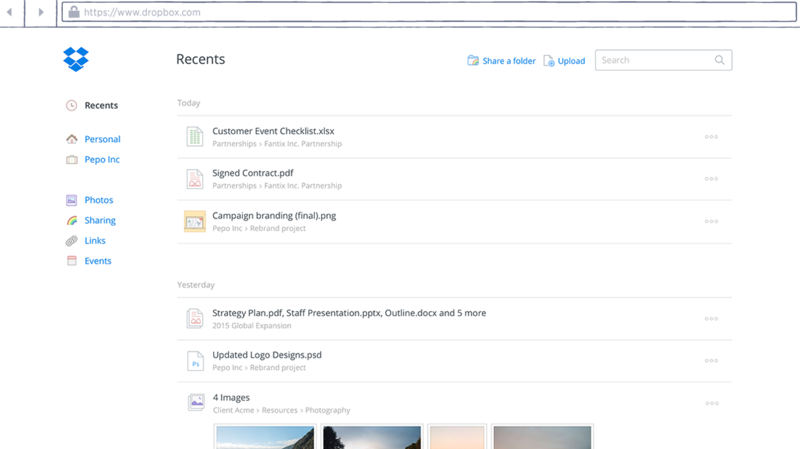 Last week, Dropbox announced a new enterprise version, a partner network and more. Read about all of that here. Julianne Hough Sparkles and Shines in Silver on "Dancing With the Stars"